Historic Carte de Visite of Jessie Vokes by the Gurney Company. Signed Jessie Vokes on bottom. 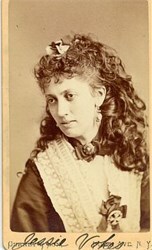 English: Jessie Vokes 1851-1884, Vokes Family, English Actress. Source Carte de Visite Woodburytype - Print. The Vokes family was a set of three sisters and one brother and a second honorary brother popular in the pantomime theatres of 1870s London and in the United States of America. Fred Vokes 1846-1888 English Actor and Dancer. Jessie Vokes 1851-1884 English Actress. Victoria Vokes 1853-1894 English Actress. Rosina Vokes 1854-1894 English Actress. Fawdon Vokes born Walter Fawdon 1844-1904 English Actor.